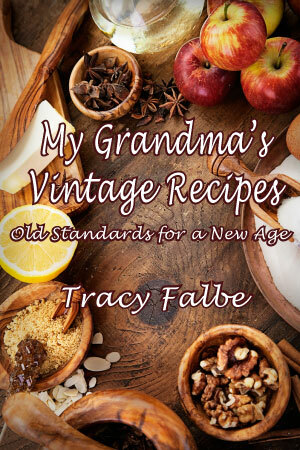 Since publishing My Grandma’s Vintage Recipes: Old Standards for a New Age in 2013, I’ve really benefited from putting together this memorial project. After salvaging over 60 recipes from a tattered notebook handwritten by my late grandmother since the 1920s, I’ve deepened my connection with my family heritage. Other people have simply bought the book because the vintage recipes interested them. The recipes in this book hearken back to 1920s Ontario, Canada, where my grandmother grew up. Most of the recipes are quite simple and require few ingredients. They were written in a time before supermarkets when people cooked from scratch with pantry staples. This is good information these days as food budgets tighten, and people want to get away from processed snacks in wrappers. This cookbook has a whole chapter on fruitcakes. I know they are a much-maligned and made-fun-of baked good, but they really don’t deserve their reputation, at least if you make one yourself. Personally, I have not felt the need to age a fruitcake and soak it in brandy, as tradition holds, because a fruitcake is so delicious on day one! Fruitcakes are super sweet treats. Make one, and you’ll add to the mood-altering festivities with each nibble. If you’re curious about baking a fruitcake, this cookbook has a recipe that I heartily endorse. It has become a holiday tradition in my family. And last year, I discovered that they freeze well too. To see ordering information for the ebook or paperback visit the Vintage Recipes page.